Revenge musical chairs is the name of the game at Ciel Hotel. The power players are all shuffling around trying to find the last remaining seat. And even if you think you’re firmly seated in your chair, there’s someone right next to you who will gladly push you off. Our characters are all finally realizing that, like in musical chairs, there can only be one winner in the game of revenge. There’s no room for allies, only foes trying to take what they believe to be rightfully theirs. Still wanna play? Better hurry because the game and its players aren’t going to wait for you to catch up. Forget Jae-wan and his weekly betrayals, it was Manager Baek who took the biggest knife, a machete really, and stabbed it deep into Mo-ne’s back. After acting the part of mother figure to Mo-ne during these scandal-filled days, she takes advantage of the chaos by convincing Ciel’s Board of Directors that Mo-ne’s poor leadership is to blame. Seriously, this Board of Directors is the worst. They are perfectly happy to use her as a scapegoat for all of Ciel’s problems as if their own hands are so clean. Thanks to Manager Baek and the most useless Board of Directors ever, Mo-ne is stripped of her Chairwoman title. Replacing her is, you guessed it, Manager Baek. As the largest shareholder of Ciel, Mo-ne refuses to go down without a fight and swears to challenge the validity of the vote. That’s great and all, except she didn’t know that Chairman Ah had signed over his shares as collateral for a loan taken out with Roman. Nobody informed her about the loan, and the last day for repayment was yesterday, leaving Mo-ne empty-handed now. Without her shares as leverage, Mo-ne is forced to ask Chae-kyung to lend her money to pay off the loan and regain her position as Chairwoman. But in face of the stranglehold that Manager Baek has on Ciel, even the tremendously wealthy Chae-kyung is unable to help. Manager Baek celebrates her hotel robbery and backstabbing success by organizing a ceremony for her intro as the new Chairwoman of Ciel. There’s even an ice sculpture! In her speech, she blames Chairman Ah and Mo-ne for damaging the reputation of the hotel with their irresponsibility. Right on cue, Mo-ne crashes the ceremony when Manager Chairwoman Baek is rambling on about how she will restore glory to Ciel’s name. Mo-ne tells everyone in attendance how Chairwoman Baek was scheming the entire time to steal Ciel from her father and then her. To cap off her Baek-bashing, Mo-ne destroys the aforementioned ice sculpture, resulting in her being forcibly dragged out of the room. To make matters worse, the entire hotel staff saw their former Chairwoman dragged out by security guards on a live broadcast of the ceremony. Ice for the drinks over here. In addition to losing the hotel, Mo-ne soon finds out that she doesn’t have a home anymore either. She comes home from the ceremony to find people moving things out of her house. Chairwoman Baek had put out an order to have Mo-ne moved out of her house so that she can move into it herself. Jeez Baek…you couldn’t even give the girl a little warning first? Mo-ne obviously loses her mind, and screams at the movers to get the hell outta there. Scared off by her outburst, the movers leave her belongings on the lawn. Upon seeing the broken picture frame on a photo of her and her father, Mo-ne drops the tough image she’s carried for the past few days, and utterly breaks down. 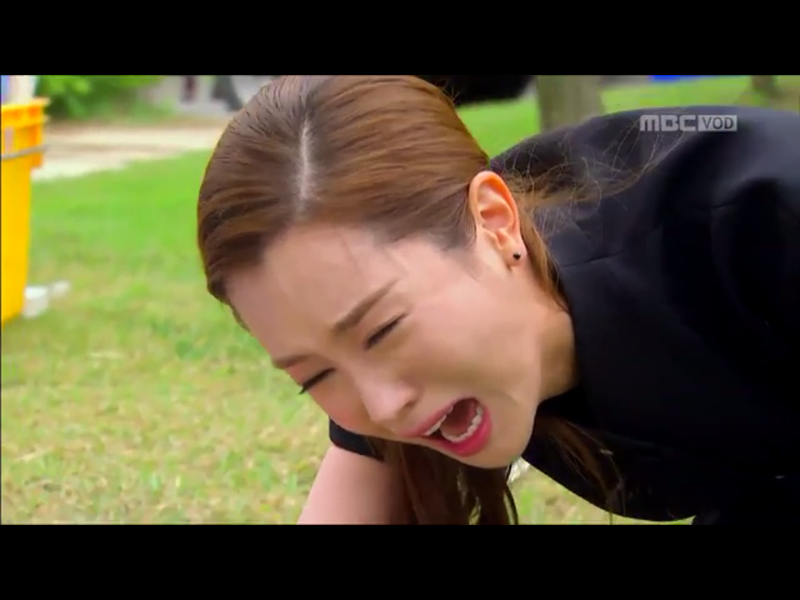 Jae-wan sees her crying from his house next door, but can only helplessly watch. The next day, he wakes up to movers bringing over the swing that he built for Mo-ne for her birthday. She had left the swing behind at the house after moving out overnight. Oh, and she left him her cat too. Poor Mo-ne. Trust no one. Jae-wan goes to the only person that he can still trust, Chae-kyung. He asks her to help him as he plots how to push Chairwoman Baek out of Ciel. Even though she’s been rejected by Jae-wan so many times for Mo-ne, Chae-kyung just can’t say no to him. She agrees, but with the condition that he does not go to Mo-ne with his love anymore. Jae-wan doesn’t believe that he and Mo-ne can have a future together anyways, so he says he’s able to easily accept Chae-kyung’s request without too much heartache. No way Chae-kyung bought that, right? Right? Love sure does make people blind. But hey, plot away, sir. With Mo-ne vanquished and Jae-wan in his final week as GM of Ciel, Roman thinks that his mom must be satisfied with finally having control over Ciel. Au contraire, silly Roman. Chairwoman Baek tells him that she actually could care less about being Chairwoman, and instead is playing a long con on Lee Joong-goo. FLASHBACK! The burn scars that Chairwoman Baek showed in the last episode are actually the results of a car chase gone wrong between young Baek Mi-yeon and Joong-goo, with her speeding to get away from him for unknown reasons. 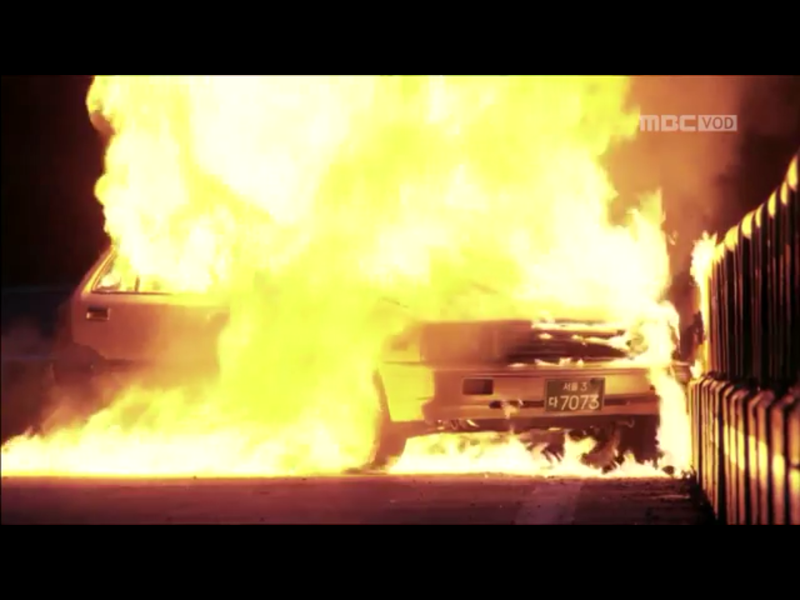 During the chase, Baek Mi-yeon crashed her car, causing it to catch on fire. Joong-goo tried to pull her out of the burning vehicle, but she refused, instead trying to pull him in so that he can burn to death with her. Right after he pulled away from her and ran, the car exploded into an enormous fireball. Baek Mi-yeon was so severely burned from the accident that she had to have her entire face, head, and body reconstructed. No wonder no one has been able to recognize the current Chairwoman Baek as the same Baek Mi-yeon from decades ago who was framed for Joong-goo and Chairman Ah’s embezzling crimes. Also, let’s please give a long, slow clap for the doctor/plastic surgeon who was able to save Baek Mi-yeon after she was 100% burned. Miracle! That’s a whole lotta fire. Working on her long con, Chairwoman Baek is playing the role of boss to a tee. But then here comes Jae-wan raining on her parade. With Chae-kyung’s help, they were able to prevent her from hiring a new person for the General Manager position. With such an important position still vacant, Jae-wan appeals to Roman to rehire him for the position. Roman doesn’t like to talk business while he’s at the sauna, so he dismisses Jae-wan and says that he’ll think about it later. Jae-wan refuses to accept no for an answer and stays at the sauna until Roman agrees. Roman loses in their sweat-off battle, and is forced to lean towards rehiring Jae-wan. It’s getting hot in herre. When leaving the sauna, Roman walks in on Jae-wan changing his shirt and sees the wings tattoo on his back that matches his own. He recalls his “older brother” drawing wings on his back when they were younger to symbolize flying away for a better life. Roman begins to wildly speculate that Jae-wan’s the same Jayden that protected him when they were younger. Jae-wan & Joo-wan 2014 reunion soon? After moving out from her house, Mo-ne moves to the vacation house that she took Jae-wan to when he was an emotional wreck after finding that Joong-goo was his father. Woo-hyun seems to be stepping up his flirting game with Mo-ne, probably because she’s not the Chairwoman anymore and things seem to be pretty over with Jae-wan. When are we getting off work?